Mr. Bob Campbell, EAA Air Academy Director, oversees the Air Academy Summer Resident Camp program for coed youth ages 12-18, which is one of the oldest, most successful aviation resident camps in America. Bob is responsible for program development, and administration for the Air Academy in its 35th year. The camp serves 275 campers annually. 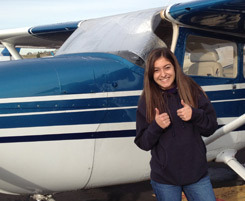 Primary programs include aeronautics, aviation technology, computer flight simulators, ground schools, low and high ropes, climbing wall, challenge course, and many hands-on activities. Kino Chavez was born in Madrid, Spain. He has a B.S. in Chemical Engineering and a M.A. in Business Administration. He retired from the Air Force in 2000 after 20 years as a pilot. He flew T37s (The Tweet), F4Es (The Phantom), F4Gs (The Wild Weasel) and F16s (The Fighting Falcon). He served in both Northern and Southern California, Germany, Alaska and Korea. He flew combat in the first Gulf War, stationed in Bahrain. He now works as manager of the Fixed Base Operator (FBO) in Taos, NM where he will talk airplanes and flying when time allows. He coordinates the flights for the Taos Middle School Flying Program and helps out with Young Eagles flights when needed. Bill is a pilot of both land and water aircraft and flies weekly. 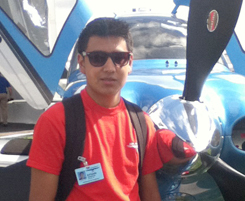 He is a regular pilot at the Taos New Mexico youth flight Saturday each Fall. Bill and Cindy provide financial support of scholarships to students in the Dallas, Texas area where they have a commercial real estate firm. Andre is a pilot with a passion for aircraft. He owns and flies over a dozen aircraft. Andre and Patricia Katz provide scholarships for students at Cistercian Preparatory School in Dallas annually. 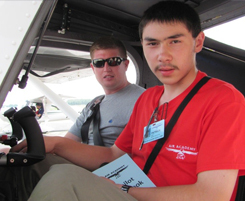 Students selected are provided an opportunity to fly in one of his many airplanes. 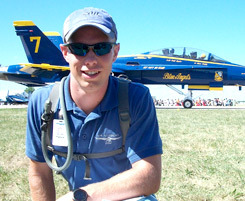 Jim Quinn has been involved with the EAA Young Eagles program for more than 15 years. Working with several EAA Chapters and pilots in the DFW area, Jim has coordinated airplane rides for hundreds of young people. For the past five years, Jim has partnered closely with Jim and Angela Thompson to help identify highly qualified candidates for EAA Air Academy scholarships. 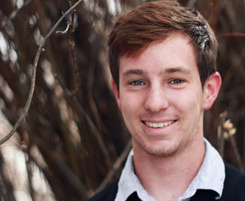 Jim holds undergraduate and graduate degrees in technology and business administration, and he has worked in the information technology field for many prestigious companies, including Arco Oil and Gas, Apple Computer and American Airlines. In addition, Jim earned a Commission in the United States Marine Corps and served on active duty and in the Marine Corps Active Reserves for 26 years. As a Mission Pilot with the Civil Air Patrol, Jim currently serves as Squadron Commander. He also received the Phillips 66 Aviation Leadership Award in 2010. Jim owns and flies a Stelio Frati designed Falco F8L, an amateur build aircraft, and has over 900 hours of flight time. Kim is Vice President of the National Coalition for Aviation and Space Education (NCASE), and is a former state aviation director in Nebraska and deputy in Arizona. Kim is also the former Director of Opertions/Communications for the National Association of State Aviation Officials (NASAO). Kim holds a commercial pilots license with an instrument ticket and publishes the State Aviation Journal and weekly Skybrief. Dr. Williams is a professional pilot with numerous certificates and ratings including the Certified Flight Instructor with Instrument and Multi-engine ratings and holds a FAA Second Class Medical Certificate and is a Designated Pilot Examiner.